The grounds of The Elvetham are wonderful for socialising during your reception and for wedding photography. The avenue of trees is a favourite location for group photographs and for some romantic images too! The Elvetham located just outside Hartley Wintney in Hampshire has 72 bedrooms and is one of the region’s finest wedding venues with 35 acres of grounds. As you come up the long driveway you can see the front of the imposing mansion house but the rear of the house and the gardens are even more impressive, especially went booked exclusively for your wedding ceremony, reception and wedding photography. The mansion was built in 1860 on the site of the previous building which unfortunately burnt down a few years earlier. This building had hosted Queen Elizabeth I in the 16th Century and was the location for the first performance of Shakespeare’s “A midsummer night’s dream”. In addition to the grandeur of the building and the history, the professionalism and personal approach by the staff makes this venue second to none. Little gestures such as giving the bride and groom a few moments on their own immediately following a civil ceremony while the guests are guided to the bar, or providing your own personal drinks waiter in the grounds while you have your photographs taken shows the level of thought which has gone into making your day extra special. As recommended wedding photographers at The Elvetham Hotel we know the staff very well and they know how quickly and efficiently we work, so that your wedding breakfast is never delayed and the food is expertly delivered perfectly cooked and on time. The majority of weddings we have photographed at The Elvetham have taken place in the Oak Room which comfortably holds over 100 guests. The Oak Room is perfectly lit with a full length set of windows down the full length of the room. The fireplace by the registrar’s table makes a wonderful background for wedding photographs of the bride and groom as they make their vows. As we use two wedding photographers on your day we can capture all the memories and emotion of the ceremony without moving around and disturbing the event. We also use the latest camera technology which means we do not use flash during a ceremony which would provide a very unwelcome distraction. The registrars who officiate at The Elvetham know us very well and trust us to do our job without interfering with the smooth running of the ceremony. Another advantage of the character of the rooms in The Elvetham is we can use them as locations for group photographs in the case of very bad weather when is it not possible to venture outside at all for photos. The staff at The Elvetham Hotel are happy to remove the chairs from the ceremony room and we can use the fireplace as a great background for photographs rather than the bland magnolia walls of a modern hotel. As experienced and professional wedding photographers we do pack a couple of studio lights in the car just in case these are required – better safe than sorry! One of the most distinctive and memorable features of the gardens at The Elvetham is the wonderful avenue of trees. This provides a fantastic backdrop for wedding photography of the bride and groom or of the entire wedding party walking casually while enjoying the party atmosphere. If this area looks familiar it could be because you have seen it featured in many examples of our wedding photography at The Elvetham Hotel over the years or it could be because the trees were used in several episodes of “The Benny Hill Show” featuring long lines of people chasing or being chased by Mr Hill himself. One photograph which always looks great at The Elvetham is a group photo of all of the wedding guests on the lawn as Adam leans out of a first floor bedroom window. This is a chance to make sure we have everyone in one shot and nobody feels left out as they haven’t been in any photos! 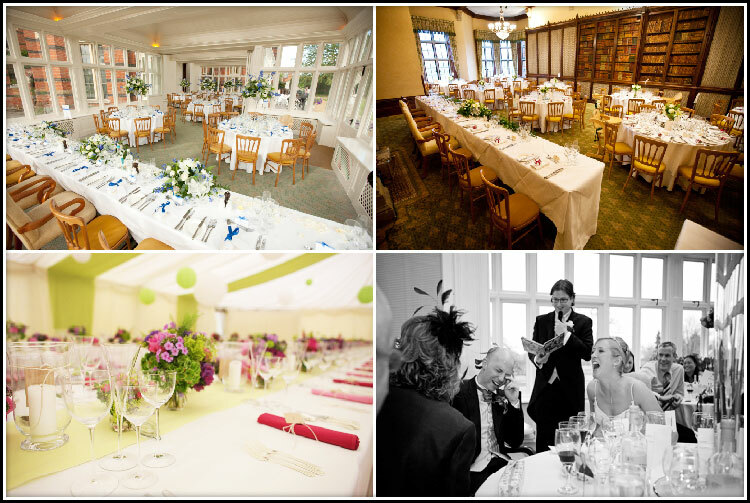 The mansion house at The Elvetham offers three different locations for your wedding breakfast. The conservatory is light and airy and suitable for slightly smaller weddings. The library is darker but suitable for over a hundred guests and for the larger weddings a marquee is the perfect option to seat all of your guests in one location. All of these options provide us with ample photo opportunities to document your speeches and to capture the reactions and emotions of family & guests. We love capturing great images of the evening festivities at The Elvetham. These range from dancing to live bands and DJs to firework displays in the gardens. As the hotel has many interlinked rooms and open areas, people can choose to chat in the bar, dance to the music or sit and talk in a quieter area, whichever suits them best. In summary, The Elvetham is a fabulous wedding venue offering sumptuous facilities, plenty of accommodation, friendly and efficient staff, fantastic food all in a classic location both indoors and out which will look fabulous in your wedding photographs. The only downside is the cost, but if your budget will stretch to it, you will have a wedding day to remember.